Sometimes we just want a good laugh. In fact, a 2015 Scholastic Kids and Family Reading Report found that 63% of children aged 6-17 wanted a book that made them laugh more than any other criteria. But humour doesn’t work on its own in a story – that would just be a series of jokes – a joke book in fact. Recently, the adults in my household have been watching The Marvelous Mrs Maisel on television about a woman who turns comedienne. What’s clear from the start, is that although there are many laughs and jokes, the story has to have pathos too, and character, and plot, because if you aren’t invested in the person, you aren’t invested in the laughs either. Who hasn’t wanted to swap their brother at some point in their lives? (I really hope my brother isn’t reading this blog). When Jonny finds a website called SiblingSwap.com he thinks he’s found the perfect solution to his irritating obnoxious older brother issues. But he pays little attention to the form he’s asked to submit for ‘swaps’, and the company send him a replacement that’s even less human than his real brother. Before long he’s returning and exchanging, but none seem quite right. Along with the obvious hilarity from the premise, there is zaniness and wackiness aplenty in this tale of sibling replacements who happen to include the ghost of Henry the Eighth. But below the surface is more than a touch of what it means to be a sibling – the loyalty, the tenderness, the protectiveness, the responsibility. And what’s more, there’s a lesson about false advertising on the Internet, and being careful what you wish for. Jonny is a likeable main character with his own quirks, but real enough, with his friendships, and penchants for Xbox, doughnuts and pasta. Add in a girl geek to the mix (everyone needs a good coder in their lives) and an extremely absent-minded carefree mother, and the comedy is set. This is a good laugh, with happily comedic illustrations, and a great ending. You can buy it here. 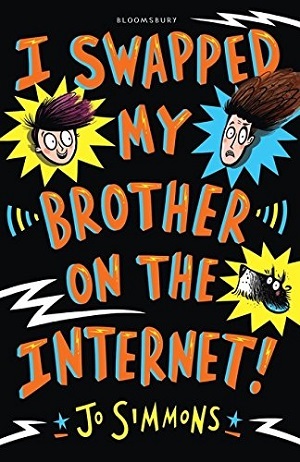 Not a ‘comedy’ as such, but with oodles of humour and light-hearted fun, this is a book that squeezes many different emotions into a story and features inter-generational relationships, and a look back at personal histories. 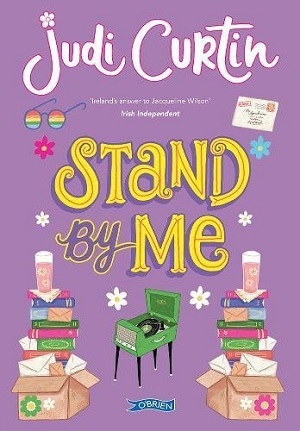 A sequel to Time After Time, although it can be read as a stand-alone, Stand By Me follows the adventures of friends Molly and Beth, who have found a way to time travel. These best friends are slightly different though, in that they live together – their two families joined together, and although there was some tension at first, by this book the two are firm friends. Molly and Beth travel back to the 1960’s to discover what happened to an old friend of their favourite uncle, and to try to exonerate their uncle from a misdemeanour that he feels he committed long ago. Once back in the 1960’s, the author shows what fun can be had writing ‘historical fiction’. Everything seems different and unusual to the modern girls, from the hair styles to the phone boxes, to pre-decimalisation and the lack of technology (mobile phones), and Curtin cleverly interweaves all these things into the plot – as well as showing changing attitudes to disabilities over time. It’s good to see the not-so-distant past represented in this way for modern children – an eye opener to the world of their grandparents. Rather than out and out ‘historical fiction’, the idea is to explore the recent past: the time of parents (1980’s in Time after Time), and grandparents (1960’s in Stand By Me). The book delves into feelings of guilt and blame, but is mainly about friendship – how we deal with adversities with friends, and how friendships last or break up, but overwhelmingly the feel of the book is light-hearted, with much fun, humour and liveliness. Music is prevalent too, not only in the book titles, which are taken from song titles, but in scenes in the book, and the illustrations throughout. It’s interesting how quickly we define eras by the music created during the time. A fun look at friendship and fixing the past. You can purchase it here.